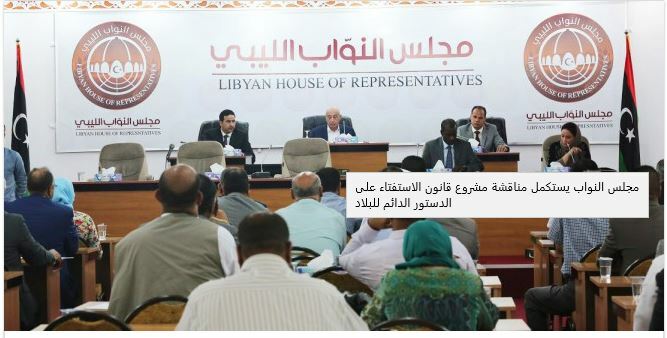 The HoR announced yesterday that it had concluded its debate of the referendum bill for the constitution at yesterday’s session- and that it will take a final vote on the bill on 30 July (Photo: HoR). Libya’s House of Representatives (HoR) completed is debate of the referendum bill on the country’s permanent constitution during its session yesterday. 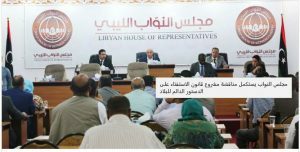 The HoR’s official spokesperson, Abdalla Belheeg, said that over 70 members attended the session and that the bill shall be voted on, on 30 July. It will be recalled that during the HoR’s 26 June session some amendments to the articles of the bill were initially voted on and referred to the HoR’s legislative committee for a legal opinion. The public commitment by the HoR to vote on the referendum bill for the constitution concurs with the timeline undertaking by HoR head Ageela Saleh at the May Paris conference on Libya. It is worth bearing in mind that the elected Constitutional Drafting Assembly (CDA) had initially presented the HoR with its latest draft constitution in July 2017, but a (lower) court ruling in the eastern city of Beida in August of the same year had prevented the HoR from debating/approving the draft. However, the Supreme Court subsequently overturned that ruling in February this year, clearing the way for the HoR to debate and vote on the draft constitution. It must, nevertheless, also be kept in mind that the two ethnically Tebu members of the CDA had not voted in favour of the ‘‘approved’’ draft constitution. Under the existing voting rules, the constitution has to be accepted by at least one of the two CDA members from each of the three ethnic communities in Libya – the Amazigh, Tebu and Tuareg. In theory this voids the vote on the draft constitution. Politically, it will be recalled that the 29 May 2018 joint communique issued by Faiez Serraj, Ageela Saleh, Khaled Mishri and Khalifa Hafter at the end of the Paris conference on Libya committed the above signatories to constitutional based elections, an electoral law to be passed by the HoR by 16 September 2018, Libyan parliamentary and presidential elections by 10 December 2018, an acceptance of the election results by all parties, an end to parallel state institutions and unified military and security institution.